Brugmansia suaveolens, commonly known as angel’s trumpet plants, are native to South America, but will thrive in U.S. Department of Agriculture hardiness zones 8 through 10. The available flower colors on these tropical trees include white, pink, yellow, red and purple. 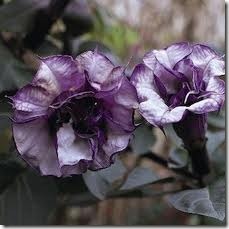 No matter what color your angel’s trumpet plant’s flowers are, the processes for maintenance and care remain the same. Despite their ornate appearance, angel’s trumpet plants are low maintenance and caring for them is relatively easy. Water your angel trumpet trees once every four or five days. Soak the area around the tree to a depth of about 4 to 6 inches. Angel trumpets need lots of water to thrive. If you experience drought conditions, feel the top 1 inch of the soil once every couple of days. If it feels dry, water liberally. Apply a balanced, 10-10-10 type fertilizer once a month beginning in April and all through the summer until September. Use the fertilizer according to the directions on the packaging. Fertilize on a day when you plan to water your tree to help distribute the fertilizer through the soil. Spread a 3- to 5-inch layer of a mixture of equal parts compost and mulch around the base of the tree at the end of autumn. Spread the mixture out in a circle with a 3-foot radius around the tree. Leave 3 to 5 inches of space between the tree trunk and the mulch mixture to prevent root rot. Mulching will help retain heat and moisture through the cooler winter months. Remove the mulch around the beginning of April. Trim back the branches once a year. Prune the tree from mid-to-late winter, when it is still dormant. Clip any dead or dying branches back to the main branches on the tree. Look for any branches that crisscross and rub against each other. When the branches move, they will rub away the outer bark and expose the fleshy innards of the tree, which will leave the tree open to infections. Pick the weaker of the two branches and cut it back to the main branch.